FYI. It appears that Bleadon Parish Council made no official comment on this major application. We are not wholly against this proposal as a potential nice new South-West leisure facility adding interest to residents & tourist alike, but overall the cohesion of the applications documents is poor and certainly not on the residents requested agenda for the 20 year development plan of Bleadon Parish Council. In brief, we find the application summary misleading. It clearly states 'non-powered water based sports' leading people to believe that this will be a quiet development, with little pollution and facilities that blend into the landscape. However, from reading the application details, and looking at the proposed site images/photos, it appears that this will not be the case and key aspects are unclear. - It appears the lakes will be 3 metres (10 feet) above the surrounding ground, not at ground level as the images imply. - This is not really a change of use of the irrigation lakes as firstly they don't exist, secondly this full planning permission is asking for taller/deeper and additional lakes which appear different size and location to the original granted application. - Will there be 3 or 4 lakes, next to the newly proposed two storey building? - Where would the future proposed fishing lake go? - Leisure hours vary, the application document indicates 6am to 9pm seven days a week, with a restaurant/cafe, with associated licenced drinking, from 9am to 11pm involving noise and traffic to varying degrees for potentially up to 17 hours a day. - Parking indicates 65-85+ cars, 2 LGV and 4 Buses.What are the true figures as documents contradict each other? Where is the simplified information showing the potential ongoing daily effect of these customers not just at peak hours? Trip data shown is based mainly on 1998 data. If one assumes that patrons come for an average of 3 hours per session, during an activity day of 15 hours (8am-9pm) then potentially there could be up to 325-425 vehicles a day visiting the site making a total of 650-850 journeys into and out of the site daily. It is even stated that "There are expected to be times when car overflow is required, which is proposed to be a flexible reinforcement (Hexmat) of the grass field already there." Also I assume that the traffic flow data show that the vehicles keep travelling along the road, not slowing down and turning into/out of Accommodation Road potentially causing traffic jams and more vehicular pollution. - This would not include any issues, including traffic, arising from proposed future developments of fishing customers at the lake; restaurant and bar customers; nor the minibus to/from the railway station. Surely this would have an effect on the road system and surrounding neighbourhood re: pollution e.g. noise, light, traffic, etc. - Documentation indicates that future plans include accommodation for groups, fishing bays and equipment hire. - Will green transportation issues be fully addressed e.g. pedestrian and cycle access. - This application acknowledges that it will affect views from Purn Hill, Uphill, Bleadon Hill and Hellenge Hill even as far as Brent Knoll. Especially as it will now involve buildings, masts and fencing. - During 104 week construction there will be an estimated 18,980 deliveries, approximately 77 maximum movements along Accommodation Road per day (8 deliveries per hour over 10 hr day) with vehicles ranging from 8.4-16.5 metres in length. -The original lakes application was only importing 80,000m3 of soil. 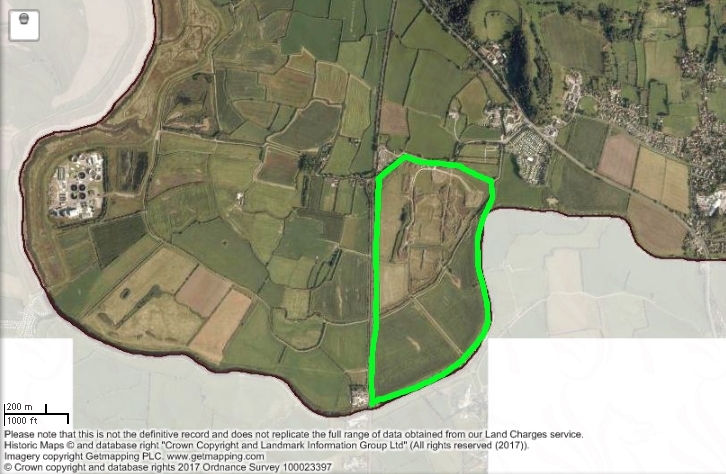 This application will be a 2 year development with an estimated 189,800m3 of soil imported from various locations but the undated, or different dates of documentation, make it difficult to ascertain where the soil will come from and how much traffic this will truly create for Accommodation Road and the A370. One document states the majority of soil will come from Wessex Water sewage treatment works extension. 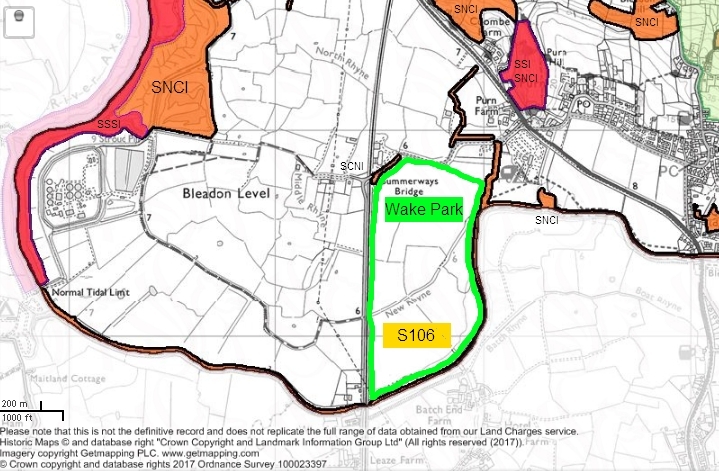 Another states that soil will come from Weston Superpond which is on the old Weston and Locking airfield sites for the Weston Village development where two lakes are being built. In another it states earth will be brought in from local building projects. We find that the information supplied with this application doesn't enable the public to make a fully informed decision. More information and time is needed to assess the real effects on Bleadon's future environment due to the varied amount of documentation, inconsistencies and missing information. Also, many of the scanned documents display incomplete information with appendices missing or poorly referenced which prevents informed comment. I see from recent comments on the NS website that professional organisations also request additional information/reports with regards crime, flood, drainage, wildlife, landscape/environment, disabled access and archaeology. The Bleadon & Somerset Level's are famous for being LEVEL so the 'Before/After' visual impact interpretation photographs are misleading as the lake 'bunds' are (I believe) intended to be constructed to be 3 metres (10 feet) above ground level (with all the imported soil) So the 'after' photograph provided is a totally false impression. Also, additional fencing may be erected, again spoiling the level view of the site. The noise report states that the noise from the motor boat would be `practically inaudible to the human ear at the nearest noise sensitive property`. If this is to be a motorised application and noise is subsequently an issue for residents, i.e. is audible, will the applicant be asked to remove the boats? If not then this application may be misleading to residents as it is billed as a non-motorised sports facility. Also what effect does the prevailing wind have on noise transmission as this will lead to any noise being magnified affecting the whole of Bleadon? Are there 3 or 4 lakes? different reports state different things and reference is already made to increased use (fishing) in the future which will presumably also increase local traffic. 3 lakes seem to be long, main, balancing (split into two). 4 lakes seem to be long, main, balancing and training? Also appear to be a different and size and location to the original lakes application. How will this also affect the Wessex Water Bleadon Levels enhancement proposals & near SNCI/SSSI? Clearly the original agreed application for Irrigation Lakes and continued farming use (at least since 1658) have not even been completed let alone used, & now a change of use has been applied for. From local hearsay a waterpark was always the intention and like the proposed adjacent Solar Farm, represents another potential sad loss of valuable agricultural/arable farming land for Bleadon (and the UK) leading to more dependence on imports. Surely these type of projects should built on 'brownfield' areas such as Weston Airfield/Hutton Moor (where much of the construction soil may be sourced). Many of the comments applicable to the neighbouring Solar Farm application (under appeal) can equally be applied to this application. Especially as regards the required security, visual impact on landscape and effect on nature & wildlife and archaeology no matter how well it maybe disguised. The unknown increased traffic during the 2 year construction phase, added with unidentified future increases of customer visits, should require an urgent review of the A370/Accommodation Road junction as further collisions to this accident blackspot are inevitable. Add this to the Bridge Road/A370 junction that also needs improvement, exacerbated by the Marshalls Quarry application, a major highway review is needed for Bleadon's transport infrastructure. Also regular weekend Boot Sale traffic at adjoining field throughout the summer will combine to make this junction horrendous as traffic ridiculously is allowed to travel 50-60 mph through it while traffic attempts to turn off it. What is the true/current business plan estimate on the number of customers, e.g. traffic per day, as estimates could be an extra 800 per day at 65 (or is it 85) parking places x 1hr sessions). A current location accident report (2011 provided in application, 3 years ago) is needed and would surely show even more incidents at this locally notorious junction area. Apparently from the report, as if this is OK, ONLY one was a fatality!! Volume of parking spaces do not add up, one document says 65 another 85 another additional overflow parking may be required. Number of employees are also inconsistent between documents one says 12 another 34. More detailed disabled and public access information is also required. Bus services to/via Bleadon are in-frequent and were recently reduced and surrounding footpath maintenance is virtually non existent especially along A370 to Weston. It is suggested that cyclists access the proposed path off the cycle network along a circuitous route on a gravel path - will this be upgraded so that it can be ridden safely? It is suggested pedestrians walk along the narrow, busy Accommodation Road without a pavement to join an existing grass PROW - will either the road or the PROW be upgraded to walk this safely? It is mentioned that construction staff are unlikely to use public transport "due to remoteness of the site and the low number of buses in the area this is not expected to be a well utilised form of transport by the construction staff". So it appears the public transport facilities and green forms of access will need closer examination. Also, without hire equipment, which appears to be a future proposal, it is highly unlikely public transport will be used otherwise! Is all this extra traffic truly factored into carbon footprint calculations, along with energy consumption during operating hours, not to mention noise and light pollution. The frequency of A370 traffic, Aircraft & Rail network already give enough disturbance to our tranquility, why add more noise on the presumptuous basis that it will be at different times, thus of course making noise continuous with no respite!! Potential of increased attraction of criminal activity to the area and need for enhanced security, perhaps 24/7. If the application is successful, how will compliance to all the various facets raised as potential concern be monitored and controlled? Eg: Fuel used, Archaeology, River Axe Water consumption, impact on Flood risk, Nature & Wildlife etc? Given it's budgetary constraints, can/will North Somerset provide resources to monitor and enforce compliance through both development and operation? People do not feel that they've been properly consulted in an easy to understand manner. On 14 April BOB asked for a copy of the presentation given at the Bleadon Parish Council (BPC) Annual Parish Meeting by the applicant, but is still waiting for the information so that it can be made available to all residents not just those who may be able to attend a council meeting. Also, although an article on this application appeared in the Spring Bleadon Village News, published by BPC, it unfortunately neglected to tell people the deadline leaving people feeling that they're now chasing a deadline they didn't feel was coming. It stated 'Alistair and Rob look forward to showing their plans to the public at the Annual Parish meeting on April 14 as well as a few other dates which will be publicised locally'. BPC meetings are renowned for being very difficult for members of the public to interact with. The agenda noted the presentation but didn't state an invitation for a two-way discussion at the meeting which may have misled people into thinking that this was a presentation to the BPC not a neighbourhood consultation enabling the discussion of any public concerns. The minutes of this meeting are also yet to be published and may not be until next year's meeting as last years APM have only just being published. The BPC conducted a questionnaire of it's residents in 2005 in order to acquire a Quality Council status. This produced results for a 20 year plan for the neighbourhood community that I believe did NOT indicate that this type of development was either anticipated, wanted or needed therefore on that basis alone, surely there should be more informed information for the public to consult and decided upon? Please see http://www.bleadon.org.uk/parishplan.html for further information. Other surrounding villages have published recent neighbourhood plans showing that they are listened to and consulted. Bleadon should be able to do the same. In conclusion, we feel the application should at this stage be rejected due to the high level of apparent conflicting information issues that have not yet been adequately investigated or explained by the supplied data. Also, given the major nature of this proposal and its complicated and voluminous documentation, perhaps a full neighbourhood consultation similar to that undertaken by Sanders for development on land adjacent to Bleadon Road, and Marshalls for their Quarry proposal, should also be undertaken? Link to previous 2011 Application 11/P/0305/F for 3 Irrigation Lakes and FYI there is already an established Wake Park less than 30 minutes away at Middlemoor that now considers Cycling and Athletics a growth area so this could be a potential white elephant for Bleadon. Thanks for pointing all this out to me, I was quite unaware of the full implications of this proposed development and have now lodged an objection.